In GizmodoWorld, no one loves a cuppa quite like I do—although the amount of times I go to the kettle each day is giving me RSI. 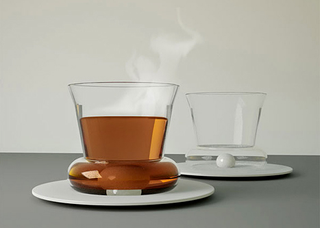 Anyways, two French guys have designed a cup of tea that stirs itself. Simple in its design, all you need do for it to work is channel your inner Cognac-drinker, swilling the liquid around the cup until the sugar has disolved. More info, including a How-To cartoon is after the jump. The cup, called Ceramic For Mix, has a protruding base that bulges out—imagine a boa constrictor after an all-you-can-eat sheep buffet—and a ceramic ball that goes in the bottom. Pour in the PG Tips, add the milk, spoon in the sugar (if that is how you take your tea) and then swill the cup. Gravity ensures the ceramic ball doesn't bop you on the nose when you drink, apparently.